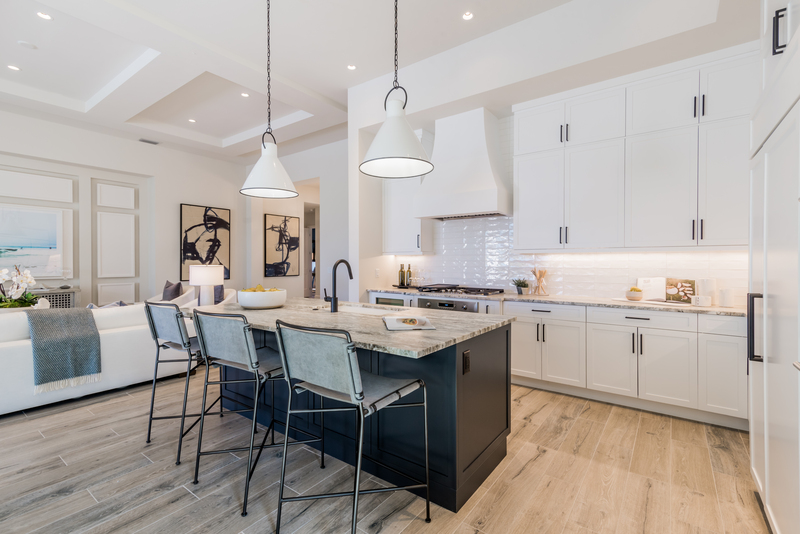 London Bay Homes' Selection Center offers a space where clients can touch, feel, and experience the many interior custom home options available to make their house a home. 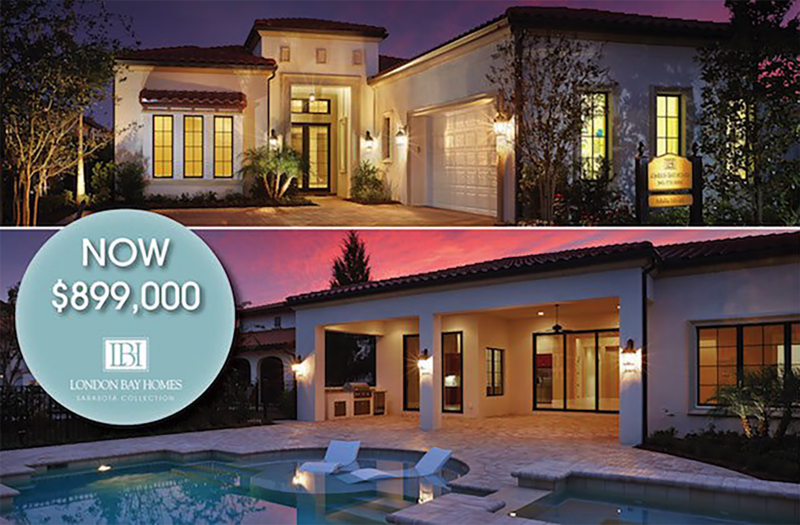 As award winning home builders in Naples Florida, the London Bay Homes team is committed to providing unique, custom-built homes to each and every client we serve utilizing our signature Private Label Living process. This process ensures that each new home is a perfect reflection of our clients’ distinctive tastes and individual personalities, and the new Selection Center is an extension of that process. Upon entering the 3,500-square-foot Selection Center, guests will immediately begin to see the latest design trends in the building industry with the many spaces designed around the open floor plan. These vignette spaces will allow guests to experience each and every room and not just choose items from a catalog or online store. 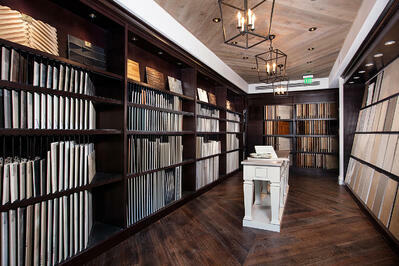 The space was designed to showcase a multitude of living scenarios and selections to spark imagination. 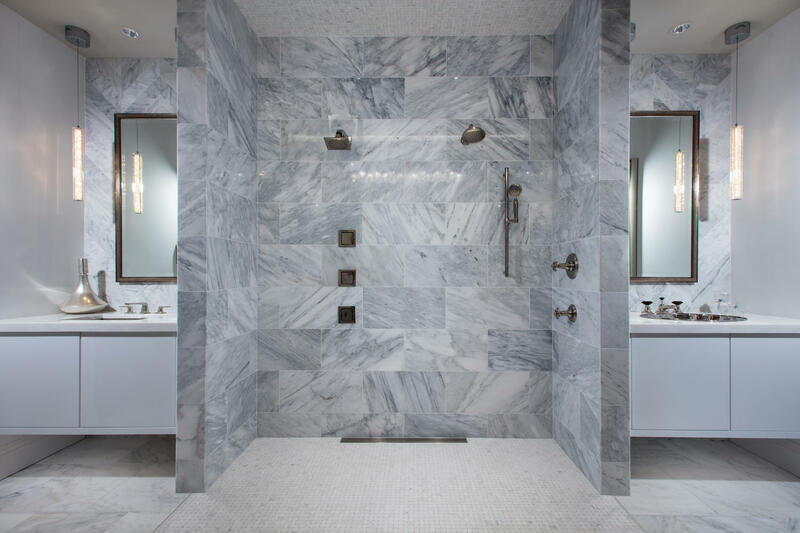 Whether it’s an exotic stone and mother-of-pearl backsplash or a feature wall made out of wood mosaic tile and sculptural 3D elements, the showrooms prompt homeowners to think outside the box and create a truly individualized experience. While walking through the studio, you’ll be able to see a home office, flooring, cabinet, and outdoor living studios, a planning room, millwork gallery, and a master suite and bathrooms. The home office shows a tranquil coastal design with custom finishes and furniture by Omega and the master bedroom evokes a spa-like luxury retreat with all-white marble walls, a marble and mother-of-pearl laser cut mosaic glass tile feature wall set behind a Kohler soaking tub, and white-ice Carrera tile flooring. The bathrooms in the Selection Center display a contrasting juxtaposition of light, bright, and ethereal designs situated opposite a more masculine, mid-century modern aesthetic. Elements in one of the bathrooms includes custom furniture and vanities with illuminated glass and a sandblasted top, while the adjacent bathroom features a psychedelic mosaic tile floor pattern, a granite sink and countertop, and a black tile feature wall. Guests will be able to see also be able to consider their options while enjoying the Selection Center’s hospitality bar, reception lounge, and kitchen. The hospitality bar features top-of-the-line Wolf appliances, including a coffee maker, Sub-Zero 24-inch tall wine refrigerator, under counter beverage center, and ice maker. The space also includes a snowfall-hued granite countertop, a peacock-themed handmade stained glass and mirror backsplash, and floor-to-ceiling stone feature wall. The reception center creates a more relaxed, Feng Shui-feel with clean-lined furnishings, a fireplace, and a limestone sidewall. 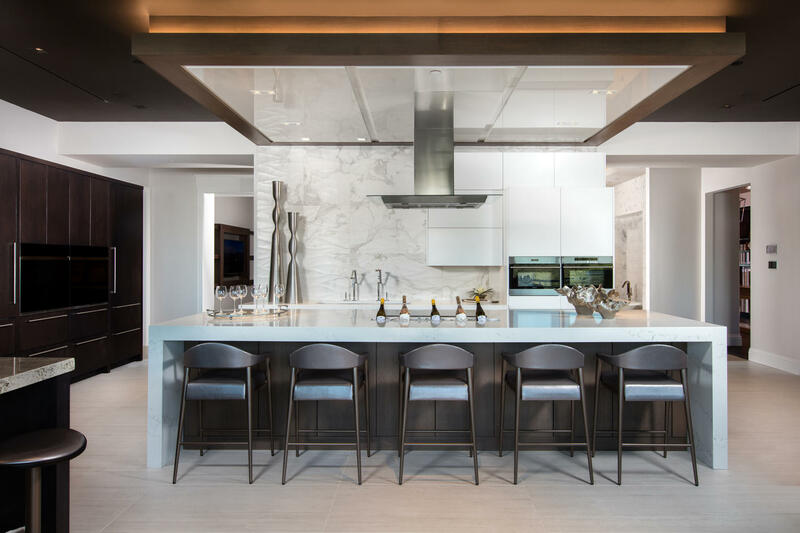 The loft-style chef’s kitchen offers a contemporary approach with custom-stained, rift oak cabinetry featuring a push hydraulic lift system, wood and leather barstools, and an 11-foot Pompeii quartz cascading waterfall island. The fully equipped kitchen also features Wolf appliances, including wall ovens, a steam oven, microwave oven, induction cooktop, and Sub-Zero refrigerators. As part of our commitment to excellence in custom home design, construction, and customer service, London Bay Homes has staffed the Selection Center with a team of professionals that are ready to answer any of your questions and help you choose the state-of-the-art finishes that will show off your personality and individual tastes in your new home. However, personalization is just one of the four steps of our signature Private Label Living process. To begin your custom home building journey, you must first decide on the type of home you would like to build and the custom home builder with which you would like to build it. For nearly 30 years, London Bay Homes has been designing and building many of Southwest Florida’s finest luxury homes, from condos and villa homes to single-family estate homes and one-of-a-kind residences. Explore the many custom home options available by contacting us and scheduling your appointment with one of our knowledgeable sales executives.